The experienced and expert crews at the EverLine Winnipeg office install parking blocks and speed bumps for all types of parking lots and parking garages. Let us help you improve the safety of your property. At EverLine Coatings and Services, we are committed to protecting your parking lot and the people that use it. This is why we provide industry-leading parking block and speed bump installation services. Our parking block installation services in Winnipeg will help protect your curbs and other parts of your property from vehicles bumping into them. Having parking blocks installed in the right area will save you from expensive sidewalk and curb repairs in the future. More importantly, we need to protect your tenants, employees, and customers as well. This should be of the utmost importance for any Winnipeg business owner or property manager. Making sure vehicles aren’t speeding and that they are traveling at a reasonable speed through your parking lot is essential to ensuring lot users safety and protecting your property. At EverLine Coatings and Services, we are the speed bump installation experts. We can install speed bumps in any parking lot to help ensure the safety of those on your property. EverLine Coatings and Services stands out from its competitors with the high-quality services and expectation exceeding results that it provides its customers. To ensure a high-quality installation that exceeds your expectations with every project, EverLine only uses the best speed bumps and parking lot materials and supplies available on the market. EverLine Coatings and Services proudly uses reflective Canadian made parking blocks on every project. The parking blocks we install are durable, visible, and effective which makes them ideal for protecting your property. At EverLine, we operate with three fundamental values that set us apart from our competitors. These fundamental values are; continuously innovate, provide systemized quality, and our promise to always answer the call when you need us. Our unwavering commitment to these values has enabled us to offer solutions that cannot be matched by our competitors. Every client receives the highest quality of work. We promise to work within your schedule, and we will always be there when you need us. It is this commitment to quality services and our work that has us at the forefront of our industry in Winnipeg. At EverLine Coatings and Services, we are considered the parking block and speed bump installation experts in Winnipeg. This is from our decades of experience and ongoing training to deliver our clients the best results with every project. Our crews receive ongoing training to ensure they are on the cutting edge when it comes to installation techniques and parking lot safety standards. Our installation crews have seen it all and done it all. They have worked with all different sizes, shapes, and complexities when it comes to parking lots and they are ready to deliver a lasting solution for your lot as well. 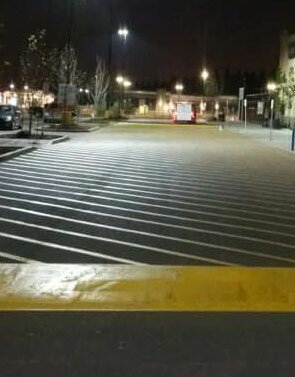 Their rare combination of experience and state of the art training has established our parking block and speed bump installation crews as the parking lot safety experts in Winnipeg. If our parking block and speed bump installation crews are coming to install blocks and speed bumps at your Winnipeg property in the near future, there are a few things you can do to prepare. Firstly, please make sure that the parking lot has been cleaned and is free of any debris. This will ensure that our crews can perform their parking block and speed bump installation services promptly. Secondly, please post notices that our crews will be working in your parking lot and make your tenants, employees, and customers aware that our crews are installing blocks. This will ensure the safety of our crews and ensure that there are no unnecessary interruptions. At EverLine Coatings and Services, we strongly believe in delivering the best value possible to each of our clients. Because of this, all of our pricing is done on a per job basis. We work to learn all the details of your unique project and the parking lot that the blocks and bumps are to be installed in. Once we have an understanding of what your needs are, we can determine a parking lot solution that fits within your unique budget and will exceed your expectations. To receive a free estimate on your upcoming parking block or speed bump installation project, please contact us.